Six years ago, First Baptist Church of Dripping Springs burned to the ground at the hands of an arsonist. Many people at that time left the church. There were about 50 people left to determine the next step. The small group hired a great interim pastor that helped the church through a healing process. At that time they also determined they would come together in unity to rebuild the church. Gradually, the church began to grow and they brought on a full-time pastor, Craig Curry and his wife, Fallon. During our second year we began looking for ways to help our church engage in outreach and missions again. For a while, the church had to focus on surviving, rebuilding, and healing. Now the people were ready to reach their community, but needed an effective way to do so. We decided that a good place to start was to apply activities typically engaged in on a foreign mission trip here at home. Our church has facilitated Mission Drippin' for three years now. Originally, our main vision and purpose for the event was missions/outreach. During the first year there were some unintended results our church experienced that were extremely positive. We quickly incorporated those results into our overall intent and vision for the event, which is now: Missions & Outreach, Deeper Fellowship, and Christian Education. Missions & Outreach - We seek to reach out to others in our community through service projects as well as events for youth and children. We ask our church members and the City of Dripping Springs to put us in contact with people (non-church members only), organizations, or knowledge of city property that might need minor repairs, lawn work, clean up, etc. Youth and children are guided to develop and execute an outreach event for their peers. Goodie baskets are made and distributed to area first responders and teacher's lounges with a thank you note. Deeper Fellowship - We seek to strengthen and cultivate relationships within our current membership as well as with the families who are considering membership. This is accomplished by intentionally designing the ministries of the week, as much as possible, to require a wide mix of ages and genders to work together for several hours. 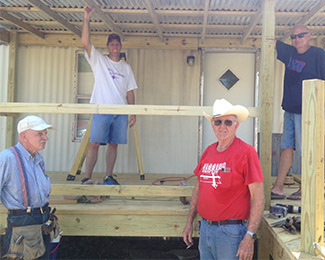 Church members become closer as they work alongside each other in serving. We also intentionally invite visiting families to take part in the effort. Families considering our church for membership have the opportunity to get to know a variety of current church members on a deeper level as they serve together. In addition, the prospective families learn more about the organization, vision, and philosophies of our church as a result of the new relationships being formed. Christian Education - We seek to incorporate the young as much as possible in order to teach them about what it means for a church to serve others. Also, we intentionally incorporate aspects of the mission efforts, which aim to, in various ways, challenge and grow adults in their understanding of church and mission as well. The aim is, as much as possible, to design events in a way that they must be lead and executed by the same age group we are trying to reach. For example, children lead (under some adult guidance) efforts in reaching children, youth lead in reaching youth, etc. Though we provide childcare for ages three and under, children and youth are strongly encouraged to participate throughout the week in addition to the particular event aimed at reaching their peers. Craig Curry is pastor of First Baptist Church Dripping Springs.